the link doesnt seem to be working sir. One problem i see is his lead arm is flying out and across…Get him to tuck his arm is when his from arm starts moving forward. Letting it fling out there will cause his shoulders to open too soon and when he gets tired his front leg might start landing too far to his left. he also …to me seems to be staying to far upright. I was always taught to have your back down when your arm is fully extended…but i might be wrong. I will work with him on that, he also has a tendency of landing his plant foot to the third base side and crossing over when he pitches. Any suggestions for helping this problem? the arm problem or landing problem? for the arm problem just tell him to tuck his arm in when he his arm starts going forward. for the landing part just mark the spot where you want his landing foot to go and tell him to step on that spot when he pitches…if he does it repetitivly it should fix the landing problem. back pretty well leaned over …it helps get your whole body into the pitch…and your kids a big kid so it should help some. (1) Pitcher drops noticeably at start of delivery. (Compare top of head to the fence rail in the background.) This creates extra unnecessary movement and directs some energy up and down instead of toward target. (2) Glove arm is sort of flung to the side and down a bit. It finished low and to the side. (3) Knee lift appears rather short. (4) Stride length appears rather short. 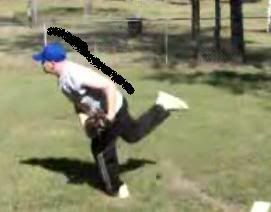 (5) Head is out in front of front foot at release. 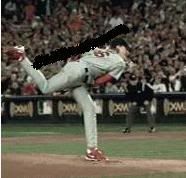 This means pitcher is not in a position to optimally use the body to throw so more stress is put on the arm. (6) Pitcher falls forward after release. To fix (1), start with the knees bent more. 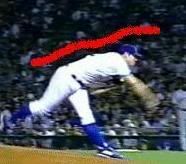 To fix (2), focus on getting the glove arm into an opposite and equal position with the throwing arm. This means the upper arms are aligned and the upper arm-to-forearm angles are the same for both arms. As the shoulders rotate, the glove should turn over and remain fixed up and in front of the chest while the chest moves to the glove. I think (1), (3), (4), (5) and (6) are all related. A lowered stance, a taller knee lift, and a little bit more momentum should stretch out the stride keeping the head over the front foot instead of in front of it. This should let the pitcher better use his body to throw and it should also keep the pitcher from falling forward after release. work with your son with the chair drill, straddle the line drill for better follow through. A scout from the Giant’s give me a pitching drill years ago for follow-through which I’ll pass on to you. Start from the set position, just stride out to a comfortable length and put a small stone on the ground a foot or two ahead and to the side of the stride (landing) foot. Now go back to the set position, stride to your spot and follow through with the throwing arm and pick the stone from the ground. You gotta bend your back to do this. Experiment and you’ll find your comfortable stride and follow-through. (chair drill & straddle the line will help too). Check you Steve Ellis’s Blog too, I think he’s got photo’s of different things that help the stride & follow through. I agree with Gotty, most of his pitches are most likely to be high, make sure he follows through and has his leg come over.